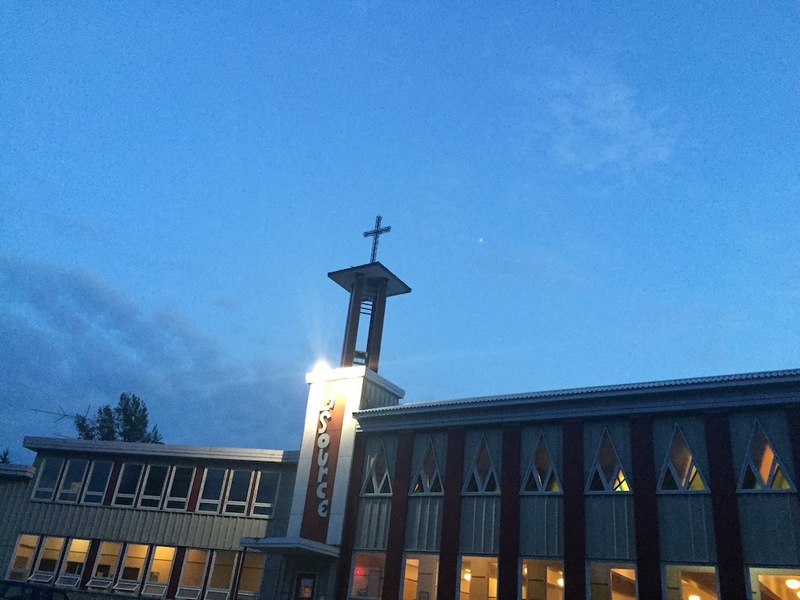 TRÉCESSON, QC — We arrived in Amos after dark and under cloudy skies the night the Perseid meteor shower peaked. It had taken us nine hours to do a seven-hour drive, which is some kind of speed record for my family. We pulled in to the Domaine St-Viateur just as a wedding kicked into high gear — there were well-dressed men in their 20s wandering the parking area balancing cigarettes and cans of Budweiser. Our suite (are you new to our travels? You can find out who we are here) was on the second floor of a seminary that was built in the 1950s or 1960s. The clerics of St. Viateur were devoted to education and developed sometimes-controversial teaching methods for people who were blind or deaf. They were responsible for the Montreal School for the Deaf and were recently the object of a class-action lawsuit following years of alleged sexual abuse. The building has been repurposed and purged of its bad juju, and has become a place to host weddings and bonfires and to meet quirky fellow travellers. One of the basement rooms at Domaine St-Viateur is a treasure trove of religious items. We had a cooked chicken and St. Hubert barbecue sauce, some potato salad and a litre bottle of grocery store wine, all of which we hauled into the communal kitchen of the Domaine. He was there with his three children, the youngest of whom was probably eight. She had his dancing eyes and her freckles bunched up when she smiled. The ten-year-old boy was on the verge of embarrassment but still drinking in his father’s attention. The eldest girl was probably twelve and determined to maintain her too-cool attitude. Each of them had lashes longer than the next. Trevor joined us at the table just as my new friend told us his name was Danny. Trev held out his hand and introduced himself around a mouthful of chicken. This spectacular dog painting hangs on the wall of the former seminary Domaine St-Viateur. While we ate, he told us about chicken meat, his accent heavy but his English excellent. Chickens have more white meat, he told us, because they don’t fly. It’s the muscle they build up flying, and how little they have to weigh, that make the difference in the colour of the meat. That’s why there’s dark meat in the legs, he said. “I told my friends that and they didn’t believe me,” he guffawed and I made a mental note to fact-check it with my farmer friend. Or just to let it go, because what in the world does it matter anyway. One of the wedding party came into the room. He had long thin hair that was tied back neatly, exposing his baby face. He was wearing a dark suit with a bright white shirt and an electric blue tie. “I’m the groom,” he said in French and we all “awwwed” as though we’d never met a groom before. We’re about to set off some fireworks, he told us, and launch fire lanterns. We were all welcome to join his friends and family in the celebration. I filled a mug with wine and joined the parade to the lakeside, where the wedding guests had gathered and were lighting giant paper lanterns. Jilly briefly met the bride and learned to say “félicitations.” We all held our breath as the lanterns rose and made a constellation backdropped by real stars that were peeking out from around receding clouds. This was more than enough excitement for one little girl who is only six, and so she said goodnight to Danny and his children and went to bed under the watchful eye of her brother while Melani and I slipped outside again to see if we couldn’t, after all, catch a glimpse of the Perseids. The wedding party had lit a bonfire and were sitting in a large circle talking in a way that sounded like singing. The bride’s gown glowed in the firelight. It was too intimate a circle to include us, so we doubled back and found a dark place not too far from them. And this is twenty years of being wed: Lying in the wet grass speaking of inconsequential things while the sky comes alive with shooting stars tearing toward the milky way. An old marriage, and a brand new one, and the universe ahead of us.